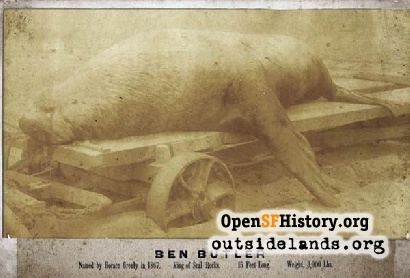 In 1895, a famous San Francisco sea lion died. 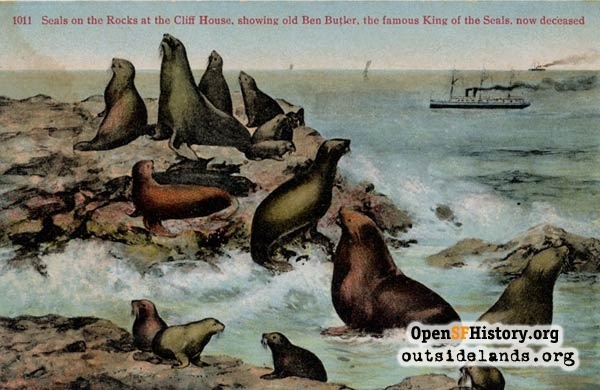 Postcard of Seal Rocks, featuring sea lion Ben Butler, circa 1900 - Courtesy of Gary Stark. They found him in the surf, bleeding from multiple wounds. They recognized him by his immense size and his distinctive head of hair. He looked up at the men and moaned once, before taking his last breath on the cold sand. It was noon on July 6, 1895. Big Ben Butler the sea lion was dead. With the possible exception of pigeons, San Franciscans have always had a soft spot for the wild animals that intersect with our urban lives. Perhaps our origin as an instant city built of entrepreneurs and fortune hunters gives us a particular sympathy for the marginalized natural world and its fauna that have the pluck to survive in less than natural surroundings. In the city's early days, two stray dogs named Bummer and Lazarus were so admired for their rat-catching abilities and apparent devotion to each other that they received constant coverage in the local papers. When Bummer died in 1865, Mark Twain reported on the funeral, and the bodies of both dogs were stuffed and put on display for decades. And many San Franciscans will remember the nationally reported adventures of Humphrey the humpback whale, who visited the bay and Sacramento River in 1985 and 1990. Perhaps this affection explains why Big Ben Butler—an impressively large male sea lion of almost 5,000 pounds, with a distinctive shaggy forelock of hair on his head—was Ocean Beach's animal celebrity for more than 40 years. 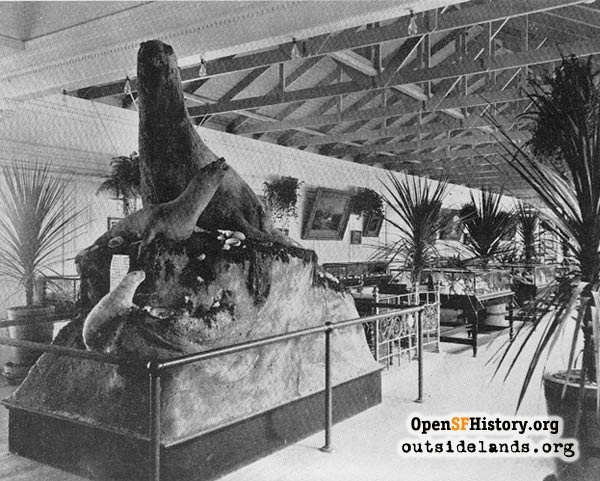 The view of Big Ben and his fellow pinnipeds sunning on the rocky outcrops below the Cliff House was a major draw from the time of the roadhouse's opening in 1863 until the great sea lion's death. Supposedly it was a visiting Horace Greeley—the famed newspaper publisher frequently credited with encouraging America to "Go west"—who nicknamed the enormous sea lion on Seal Rocks, noting a resemblance to Benjamin Butler, the Civil War general, congressman and governor of Massachusetts. At least on the west coast, it was hard to say which Ben Butler became more famous. After the human Ben Butler died in 1893, a local teacher's elegy for the man confused his students who knew only the sea lion. The carcass of Ben Butler, sea lion., 1895 - Courtesy of Gary Stark. Observers who found the great sea lion dying on July 6, 1895 noted numerous wounds. Big Ben did have some enemies. Local fishermen grumbled that the sea lion chased off schools of fish, stole the catch and damaged nets. Big Ben Butler's wounds appeared the result of battle with another male during mating season, but it was also not unknown for fishermen to shoot at the sea lions. 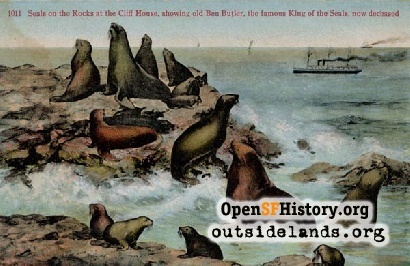 The San Francisco Call newspaper reported just a few months before Ben's death that the sea lions' human competition "denounces the sentimentality which permits them to dwell unmolested on the rocks." Despite the fishing community's scorn for his popularity, Big Ben's death was major news and his status as a local tourist attraction would not end. The New York Times published his obituary. For days, the sea lion's massive 15-foot-long body was displayed on Ocean Beach under a striped canvas tent. 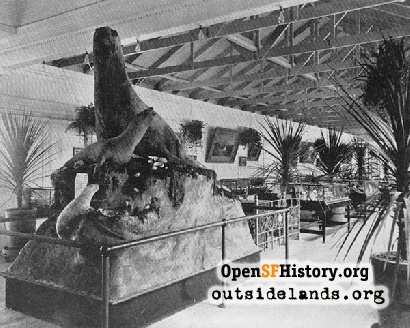 San Francisco Mayor Adolph Sutro, who was in the process of rebuilding the Cliff House into its grand Victorian version and creating his pleasure grounds and natatorium of Sutro Baths, had Big Ben sent to a taxidermist. Just as he had ruled over his harem in life, Big Ben Butler dominated the promenade of curiosities in Sutro Baths for decades. Outside at Seal Rocks, the public soon attached itself to a new attraction: a large female sea lion they called Mrs. Ben Butler. Page launched 21 January 2011.